The ’70s were all about the wedge. It was the shape to have, whether it was haircuts, shoes or sleek, low-cut supercars that could cleave right through the air with minimal effort. Italian design houses Bertone, Giugiaro and Pininfarina took that idea to the extreme, while exotic car builders like Lotus, Ferrari and Lamborghini turned some of those dreams into showroom stars. Owning one of these cars today usually involves some sort of reality check, though. Most carry some combination of sky-high prices, cantankerous drivelines and unrealistic ergonomics. There is one wedge that delivers pleasure without all the pain. Meet the BMW M1. 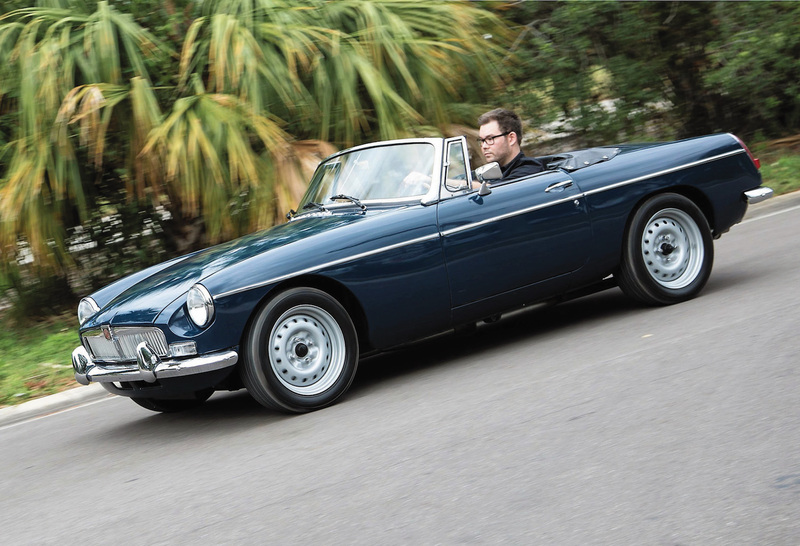 According to Hagerty, prices have recently dipped a bit off their highs, despite the fact that only 399 road-going versions were built. Now might be the time to buy one–assuming, of course, that you have the cash. For the rest of us, the M1 still offers a glimpse into the first days of BMW Motorsport, the group that has since given us so many fan favorites, like the M3, M5 and M6. 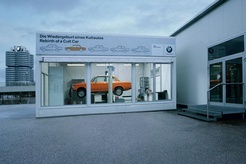 BMW spent the years after World War II reinventing itself. The former luxury nameplate helped get Germany back on its feet with the humble Isetta; smart, practical sedans followed. 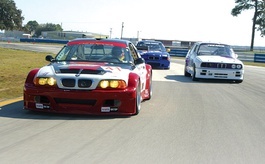 The 2002 showed the world that sedans could be fun and spunky, and by the mid-’70s BMW was ready to take on the world’s top brands in Group 4 and Group 5 competition. 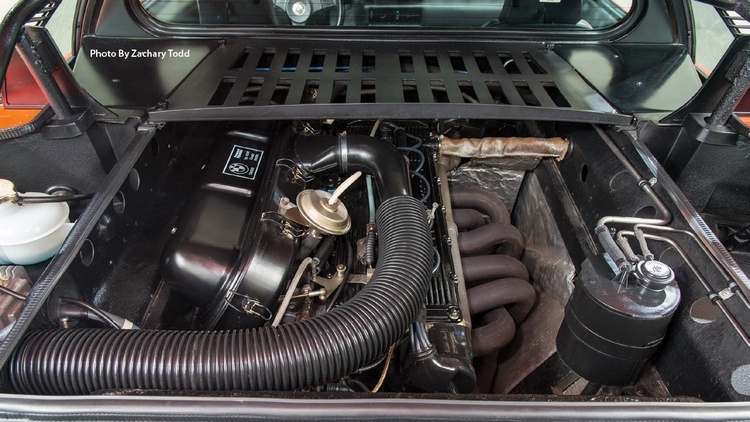 The mid-engined M1, approved in 1976, would be their weapon. Initially, the Giugiaro-designed M1 was to be assembled by Lamborghini, but their worsening financial situation and assembly delays caused BMW to move assembly to Baur, the German convertible builders. After those delays, production officially began for the 1978 model year. By that time, however, the rules for international Group 5 silhouette racing required homologation numbers that BMW wasn’t going to meet. Jochen Neerpasch, head of BMW Motorsport, had another idea: Take the Ml to the new Procar series instead. 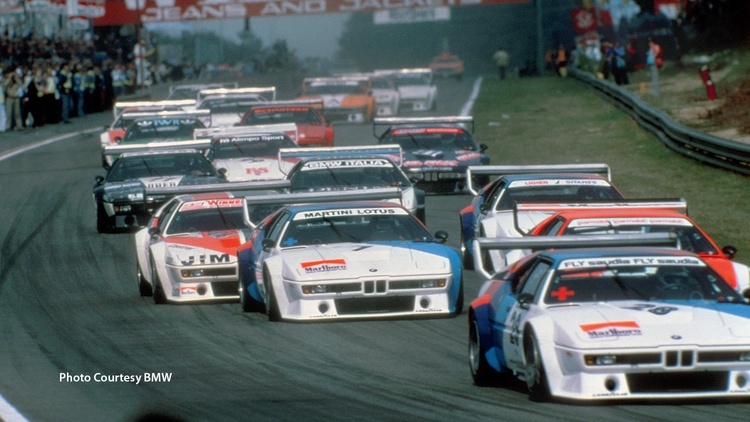 Formed to support European Formula 1 races, the Procar series would be a one-make affair, with everyone on the grid conveniently driving a Group 4-spec, 470-horsepower BMW M1. To sweeten the pot, BMW would field five cars for F1 stars. The series, which ran in 1979 and 1980, exposed the M1 to the right audience while helping to sell some of the cars required for Group 5 homologation. Unfortunately, by the time BMW had built enough cars to meet the Group 5 homologation requirements, the M1 was no longer competitive–even though its turbocharged 3.2-liter engine made some 850 horsepower. The Porsches were just too entrenched. The M1 did see some on-track success, though, as David Cowart and Kenper Miller dominated the 1980 IMSA GTO series with a former Procar. And then there was perhaps the most famous M1 race car: Andy Warhol hand painted a Group 4 racer, and in 1979 Manfred Winkelhock, Marcel Mignot and Hervé Poulai drove it to a second-place class finish at Le Mans. While the model wasn’t a grand success on track, the M1 story leaves us with a fantastic road car. 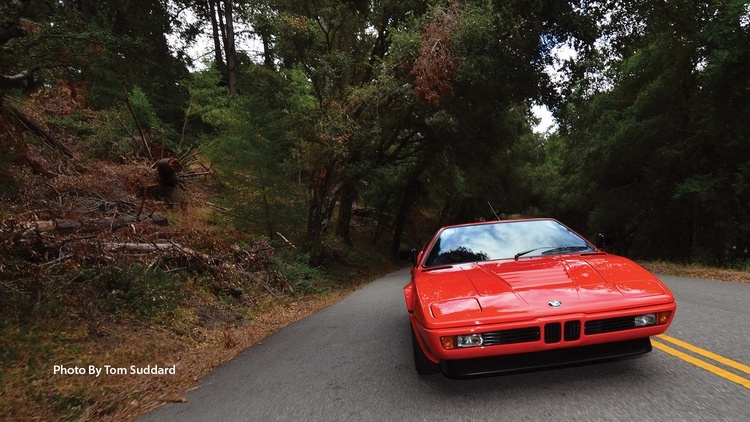 The street M1–which, according to BMW, accounted for 399 of the 455 M1 cars built during the 1978–’81 model run–was designed around the 3.5-liter straight-six that also powered the company’s more mundane sedans. A 24-valve cylinder head helped it put out 277 horsepower at 6500 rpm. Later we’d see almost this exact same setup in BMW standards like the M5 and M6. While exotic for its time, this engine isn’t too exotic. 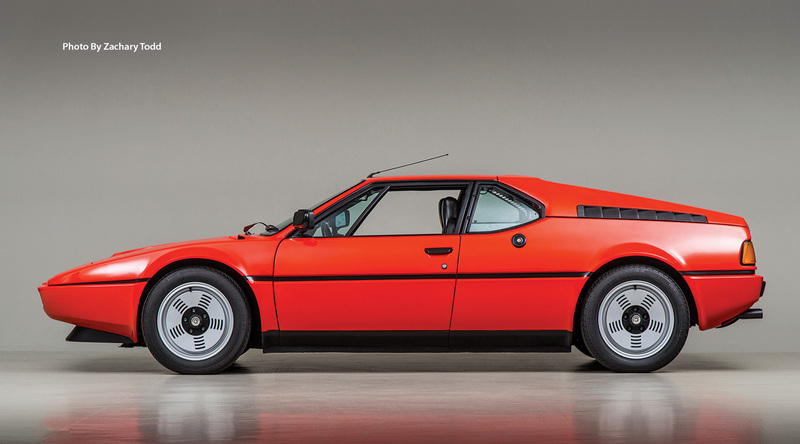 The M1 was like no other BMW of the past, present or, perhaps, future. BMW’s typically upright, Teutonic driving position was absent. The look and feel were more Italian. One sits low in the M1, and ingress and egress are certainly not on a par with the later M-cars. Those newer offerings, though, don’t offer such exclusivity. An M1 doesn’t feel like any other BMW of its time period. While many of the interior components and the engine’s soundtrack allude to the fact that you are driving a BMW from the mid-’70s, the overall gestalt of the M1 is clearly limited-production 1970s super car. Try to get into an M1, and you’ll quickly discard any illusion that you are entering a standard BMW. Gone is that familiar big greenhouse. 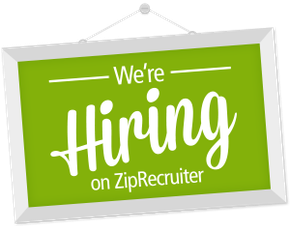 Also missing: the ease of ingress and egress. While the M1 shares a lot with BMW’s more mundane offerings, the low seating position is clearly a departure. Even the ever-present horsehair aroma that’s usually found in BMWs is absent from the M1. Those seats are surprisingly upright. This means the M1 is just not designed for a 6-foot-tall, 240-pound driver; even with the seat all the way back to accommodate longer legs, headroom is still too tight. 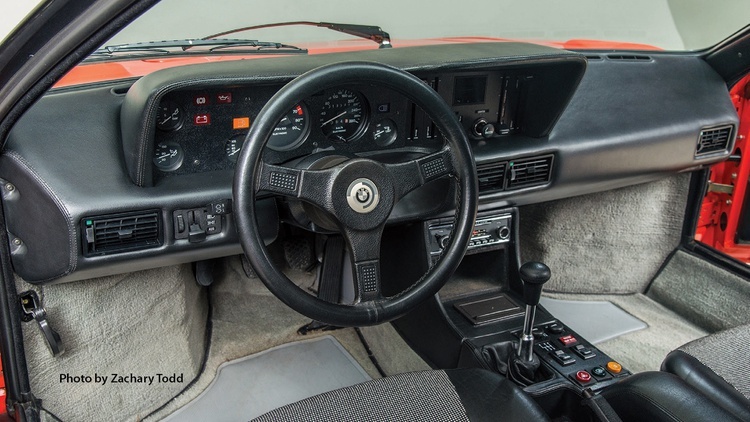 The interior is nicely finished in a limited-production supercar sort of way. The driver is surrounded by lots of hand-stitched leather and vinyl. Other than some of the controls, there are few obvious parts-bin items. The steering wheel is small, wrapped in black leather and, unlike newer M-cars, lacking any M logo. The door panel inserts on the Canepa car feature that kind of cool, checkered fabric so common to cars of this era. A Becker Europa radio in the dash serves as further reminder that this car was built nearly four decades ago. One sits on, not in, the rather attractive seats. Again, the science of ergonomics was not fully developed when this car was designed. Despite the rather cramped cockpit, once you’re in it the car is quite comfortable and legroom is plentiful. Turn the key, and that fuel-injected six jumps to life right behind your head. There is no ground-shaking pounding, no excessive intake noise, and no drama. While the engine’s song is certainly audible–and it is a fine song at that–it is surprisingly unintrusive. Turn the key, and that fuel-injected six jumps to life right behind your head. There is no ground-shaking pounding, no excessive intake noise, and no drama. While the engine’s song is certainly audible–and it is a fine song at that–it is surprisingly unintrusive. When it’s time to move, the first thing that stands out is the dog-leg shifter; first gear is back and to the left. 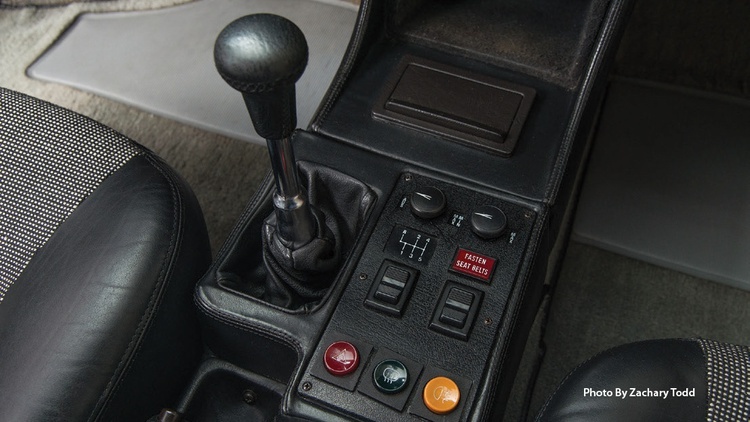 Once the car is moving, the shift action feels much better than the typical dog-leg box one finds in a mid-engine exotic. Five speeds yield comfortable cruising. The steering feels heavy at first, but quickly lightens up when under way. After a few minutes behind the wheel, one forgets the challenges of getting into the car. This is a rather nice, handbuilt ‘70s exotic. While the M1 doesn’t surge forward like a modern supercar, laying into the gas fills the cockpit with the whine of BMW’s famous inline-six. 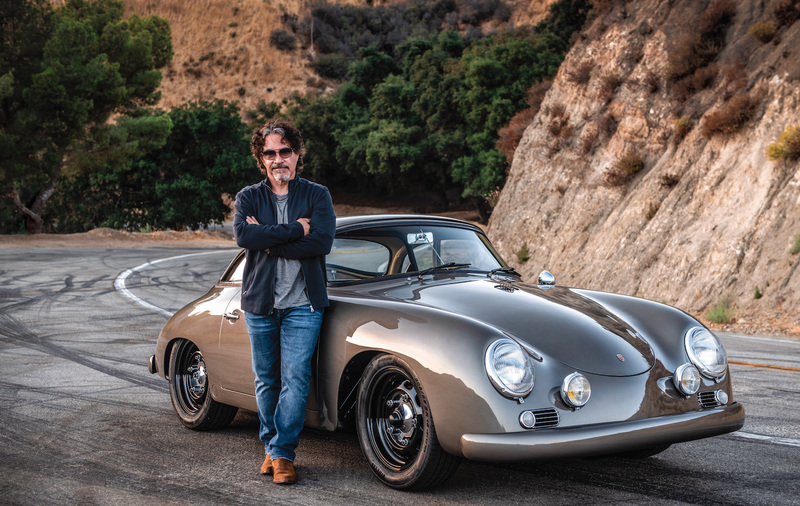 The ride, while firm, is not at all punishing, and the direct steering communicates well without delivering that nervous vibration so prevalent in older mid-engine sports cars. The brakes feel firm, but are very progressive and not at all grabby. They certainly give off a vibe of complete capability. 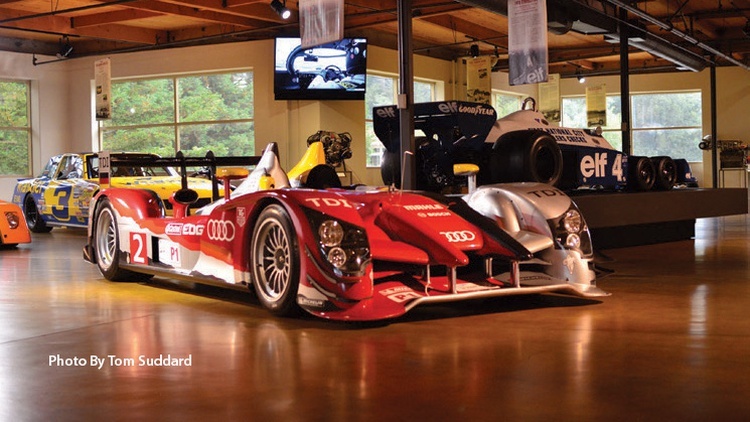 Like so many other sports and super cars, once speed increases, the minor quibbles quickly fall into the rear view. Now might be the time to buy one–assuming, of course, that you have the cash. The only reason I don't own one. I've lusted after them ever since they were introduced. There is a logical argument for you.